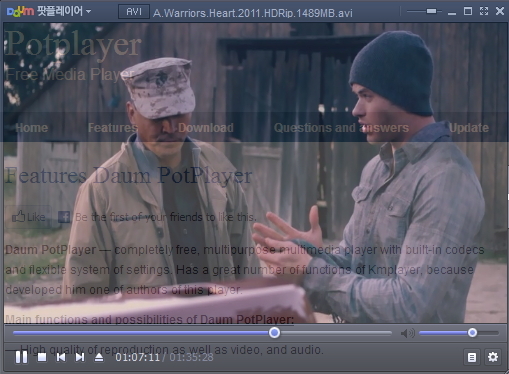 Daum PotPlayer — completely free, multipurpose multimedia player with built-in codecs and flexible system of settings. Has a great number of functions of Kmplayer, because developed him one of authors of this player. — High quality of reproduction as well as video, and audio. — Support of all modern videos and audio of formats. – Supports all types of subtitles, the effects in the subtitles. — In player there are all necessary codecs for reproducing of video and audio. — A supported 32 – 64-bit OS. – Play- not downloaded (broken) files. – Ability to watch videos through a proxy. – Ability to use the Web-camera. – Ability to change the playback speed. — Changes of scale of the image. By means of the Num 1, 2, 4 … and Ctrl+Num 2, 4, 5 … buttons it is possible to change the scale and an image position to your taste. Support of various skins, logos, color subjects. Transparency of a player. By means of this function you can change transparency of your player from 10% to 100%. This record player is fully the free program. You can set him and use so much, how many you will want. Daum PotPlayer contains no internal advertisements and various spyware. The worst things about potplayer is that, those buttons next to play button (◄ and ►) will not open the next/previous files in the playlist. This has driven me insane! and the other problem is that I does not play the next file in the play list either! Right click on teh preious/next buttons work. I’ve assigned the back and forward buttons of my mouse to perform this function. I’ve also set the wheel to ship or backtrack 5sec on each interval of turning the wheel. Effectively making it possible to scroll trough the video. PodPlayer is hella flexible so don’t let something little like that stand in your way. Is there a command line somewhere we could change from seek to previous track / next track etc. What is the name of the skin shown here and where could I download it? It’s the old default skin. Yes I also don’t like the new one and went back to an older version of potplayer to copy the skin to use in newer versions. Here’s a link to that old default skin. – Playback speed indicator/control in play bar. Go to General » mouse and you can easily set single click to play/pause. Same for fullscreen (keep AR)/restore as it’s called in the list of predefined options available for the dubble click function. Don’t know about the playback speed indicator as I rarely would wish to change it. But maybe there is another skin that would feature this particular piece of indication. By the way if you want easy control over this feature you could attach it to the scroll wheel of your mouse, just a suggestion. loving it, especially the speaker configurations, I mostly play stereo in 5.1 with prologic. Discovered this after using MPC-BE for many years. WASAPI release audio device when idle. MPC-BE releases the audio device when paused or stopped and I find this very handy. Please can you forward this request. The most efficient ( low cpu hog, fast load/scroll) and able to make images player. HI! I am looking for a skin for PotPlayer that has the a-b repeat buttons on the player like Kmplayer usually has. Any idea where I might find this skin? I am pretty new to PotPlayer. I have been playing around, experimenting and setting up my preferences on and off for about a month now, The Daum PotPlayer has a lot of promise in the future of being an excellent multimedia player. In fact, it is a pretty good player now. I just have to get use to the features that it has. I would appreciate it a lot if someone can tell me where i can find and download this skin. Thanks! How to get sound on my pc same time when I visualize the vhs cassette? The sound will be recorded on my pc automatically from the vhs cassette into the new digital file? I have a W10 on my pc. Just PUSH the dang buttons until it works! when you pressg TAB for “Display Full Playback/Audio Tag Info on Screen” do the differnt colors of the fonts mean anything?